If you are growing a bonsai then one of the most essential thins that you have to know is how to trim it. Normally in a bonsai you will have to trim two important parts, the roots that is at the bottom of the plant and the foliage which is at the top of the plant. By trimming your bonsai you will be in turn polishing your creativity and imagination. Trimming the roots is necessary as it lets the tree to develop fresh roots. As the bonsai trees are placed in smaller pots, their roots are normally underdeveloped. The plant will get sufficient room to develop fresh roots as a result of trimming the roots repeatedly. This lets the plant take in more nutrients and moisture from the soil. Like any other plant in a bonsai too the root formation is very essential for better development and health. Trimming the bonsai’s foliage is also very necessary but just for the look. In case you are growing a bonsai you must be having a particular look for your bonsai in mind. Trimming will help you to get the shape and look you wish for. 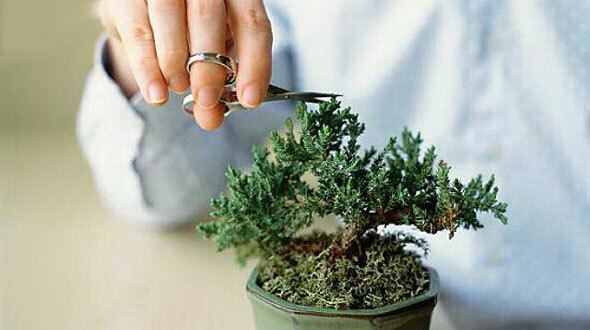 Trimming also helps in removing the dead leaves and keeping your bonsai very attractive. As the roots and the Foliage of the bonsai tree are interrelated; if you trim the foliage or the leaves you will be decreasing the strain on the roots naturally. This simply means that the fewer the leaves are the lesser the work the roots have to keep the leaves alive. Depending on the shape you want to achieve, you have to decide how much trimming is required. Therefore it is always better to have a plan before you start trimming. Bear in mind that the changes you make on the bonsai by trimming will remain permanent. In case you cut off a branch then it will remain the same until there is some fresh growth. Make sure that you carefully trim the tree. In case you want to remove leaves then pluck it tenderly with your fingers. Many bonsai owners like to trim the branches that cross the trunk on one another as they feel it does not look very good. Therefore till you feel you can’t rewire the branch and compel it to grow in some other direction, do not trim it off. Finally it is all up to you whether or not to trim your tree. But the most essential part is that you must ultimately be satisfied how your bonsai looks. What others suggest really doesn’t matter. Trimming is supposed to be exciting. Do not worry if your bonsai tree does not look the way you wanted it to be. You will be able to create better bonsais with experience.